Marty Roberts was how many country music fans remembered him. But his parents gave him the name Martin R. Schopp. Early western movie fans knew him as Tex Martin. Marty Roberts got an early start to his radio career when he was appearing on WDZ in Illinois when he was only in his second year of high school. In the 1930's, he was a part of the Tennessee Ramblers group and did some of the vocals for their Bluebird recordsings. He also appeared in several movies. 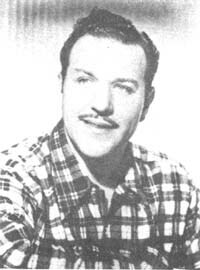 Around late summer of 1943, Marty was appearing regularly on The Breakfast Frolic show over radio station WJJD in Chicago when he got drafted by Uncle Sam to serve his country during World War II. Later on, when in Cincinnati, he was on the Coral label. In the mid-1950s, he was a disc jockey with Nelson King on WCKY in Cincinnati, Ohio. His career included over 40 years as a disc jockey. Marty passed away in November 2009 in St. Petersburg, Florida. He is survived by his two sons, Allen and Martin.